I am happy to hear that dermaneedling works for the acne scars of your friend (as you wrote in your email to me). In general, burns need long needles but the area at the back of hands is thin and 2 mm size needles are too long. In your case, I suggest a 1 mm dermastamp (not a dermaroller). In the future, if you do not get substantial improvement with the 1 mm size, you could even try a 1.5 mm dermastamp (depending on how it goes with the 1 mm size - whether you bleed a lot, get bruises etc.). Initially, Tretinoin makes skin dry. Wrinkles and lines are more visible on dry skin and that is why it may seem in some cases that Tretinoin worsened wrinkles but it did not. Long term, Tretinoin improves wrinkles. However, I do not recommend using Tretinoin on the sensitive skin around the eyes. Our Infadolan ointment that contains Retinyl acetate is much more suitable in this area. Dermarolling / Microneedling / Why don't you sell 2.5 mm needles? Buy a 2 mm dermastamp. 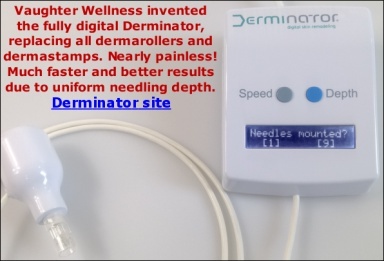 Its needles penetrate deeper than those of a 2 mm dermaroller and the area you're looking to treat is ideally suited to be treated with a dermastamp anyway. Dermarolling / Microneedling / Re: new indented scar-copper peptides for healing w/o dermarolling first? I know that you know but for the others: Please, never forcibly remove scabs because a prematurely removed scab can end up as a permanent scar. Avoid everything that can prematurely remove it, such as exfoliation, massage, picking on it etc. Keep the scab very much moisturized; it will keep them longer in place. I think your scar will likely improve by itself. Wait at least one month. If it doesn’t improve, start dermastamping every 10 days with a 1 mm dermastamp. You do not need the copper peptides now. Continue with your regime. Biocorneum just forms a breathable film on the scar which keeps it moist and protected. If possible, avoid the makeup or apply just a little. What exactly are you planning to improve on in regard to the rest of your skin? Do you have scars, hyperpigmentation, clogged pores or other problems? Dermarolling / Microneedling / Re: Single needled 1 stretch mark 3 1/2 weeks ago. Mark still red. Normal? If you are very prone to get hyperpigmentation, do not roll again until the redness is gone. Try anti-inflammatory gels but do not apply them on the day of your microneedling session. Start about a week later. Aspirin is also an anti-inflammatory. To be honest, I do not have an explanation either because this should not happen. Indeed the 2 mm needles appear to be too long for you. For scars in your case, I recommend a 1.5 mm dermastamp in combination with your 1.5 mm dermaroller. Give your skin time to recover now. It will likely still go back to the previous state if you give it time. Dermarolling / Microneedling / Re: Could I possibly push too hard when using numbing cream? In any case, there is no danger in pressing down too hard. The needles cannot penetrate any deeper than their actual length. I recommend buying a regular 0.5 mm dermaroller, using it three times a week to enhance hydroquinone penetration. Apply hydroquinone right after dermarolling. Do it for three months and then a one month break and so on. For your scars, use a 1.5 mm dermastamp with 35 needles. If your scars do not improve in six to eight months, add the suction pump and use it on the rolling type of acne scars. I am delighted that dermarolling worked for your face! We used to sell Tretinoin gel but now we sell Tretinoin cream (0.025%, 0.05% and 0.1%). I am sorry. I do not recommend rolling daily with a 1 mm size dermaroller and Minoxidil. You do not have to roll so deeply for Minoxidil penetration enhancement. You should use a 0.5 mm regular dermaroller every other day and a 1 mm roller once a week. Minoxidil can have quite serious systemic side effects when overdosed and rolling daily with a 1 mm size could result with too much Minoxidil reaching the blood stream. I used to advice against using > 0.5 mm needles on the scalp because I was concerned/overprotective about the theoretical possibility of the needles damaging the vellus hair follicles but I have extended the size to > 1 mm because in practice it is unlikely that the needles would damage the follicles and a 1 mm dermaroller cannot reach the vellus hair anyway as it penetrates only about 0.7 mm into the skin. Terminal hair follicles reside about 3 mm deep in the scalp which is too deep for any dermarolling needles to reach. Nevertheless, my concern was the vellus hair follicles that are only about 1 mm deep in the scalp skin and the hair follicles that are in a transitional phase between terminal and vellus forms. Unfortunately, in the process of balding, terminal hair follicles and intermediate hair follicles change and they start growing vellus hairs rather than terminal hair. Yes, we will consider selling a 0.75 mm size dermaroller. (Meaning, it will be in our store somewhere in the first half of this year). Dermarolling / Microneedling / Re: Fresh adult chicken pox scars, which roller should I use? Stamp it eight times. If it heals well, you can increase it to ten. Excessive/droopy skin above the eyes can be improved but dermaneedling can tighten the skin only to a certain extent (definitely not as much as in blepharoplasty during which the excessive skin is cut off). The wrinkles and lost elasticity around the eyes can also be improved but dermaneedling around the eyes is a bit more complicated than elsewhere. When you put your finger under or above your eye, you'll feel a bone. Do not dermaneedle closer to your eye than where that bone is (due to a risk of eyeball injury). When you dermaneedle around the eyes, pull/stretch your skin away from the eye with your other hand and roll/stamp it with the other. For the time being, I recommend you either our 0.5 mm dermastamp or a 0.5 mm narrow roller. You stamp or roll the droopy skin by pulling them up, away from the eye with one hand and using the mcironeedling tool with the other hand. When you become proficient in dermaneedling, you can go for a 1 mm dermastamp. Please look at our sticky forum postings. Some of them were posted by our customers who improved the area around their eyes with microneedling. "I would like to add that I found it easier and less painful to use a 0.5 stamp instead of a roller around my eyes." If you ask her on the forum, she may give you her recommendation. I have managed to almost completely get rid of the wrinkles between my eyebrows (11's) and around my mouth with dermaneedling but not of the crows' feet. Somehow those wrinkles did not respond to treatment in my case. This seems to be very individual. Start slowly to see how your skin reacts. In general, for your purpose, you should stamp the same area about five times. The areas with wrinkles about eight times. This type of scar is very likely to improve. I recommend a 1.5 mm dermastamp with 35 needles (stamp the scar densely every three weeks). If you get no improvement after six months of stamping, add the suction pump. Your photos are about 3x enlarged so your pores are in reality much smaller than on the photos.. It is very difficult to distinguish a scar from a pore. Start stamping the scars that are the biggest in diameter – the crater shape scars. You have just a few. You can try your dermastamp on the enlarged pores as well but do a test patch first to see how it reacts. Pores are ducts in the skin and their size is the smallest on the skin's surface and as you go deeper into the skin, the pore channel widens. That is why abrasive methods such as dermabrasion don't help to reduce pore size and there is currently nothing that can reliably and permanently reduce pore size. Dermarolling / Microneedling / Re: can dermarolling transplant mole cells elsewhere? No, microneedling cannot spread mole cells. Moles and freckles are not contagious. They consist of dense accumulation of melanocytes, which are cells that are normally present everywhere in the skin and they produce skin pigment melanin. Melanin is our natural UV filter. The darker the skin, the better it is protected from UV damage. Melanin is also present in the iris of the eyes. Blue eyes have a layer of melanin in the back layer of the iris. Brown eyes have a layer of melanin in the back and also in the front layer of the iris and they are better protected from the UV. Albinism is the disorder of having no or almost no melanin. Moles are hereditary and sometimes they are triggered by excessive sun exposure. You should of course never roll (or do anything else) over those moles that are malignant.